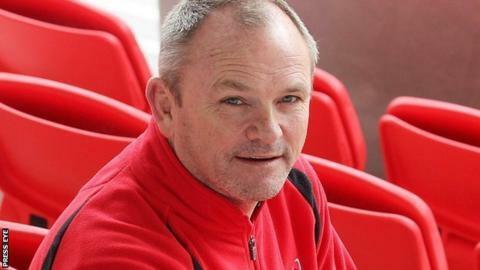 Mark Anscombe has left his position as Ulster Rugby's head coach after two seasons in charge at Ravenhill. Anscombe's departure comes just three weeks after the Irish province revealed that director of rugby David Humphreys was leaving to go to Gloucester. Ireland assistant coach Les Kiss is to take up the post of interim director of rugby to allow time for a review of the coaching structures to take place. Kiss will combine his Ireland duties with his new role at Ulster. A statement released by Ulster on Monday said that Anscombe would be leaving his position "with immediate effect". "I would like to pay tribute to the contribution that Mark Anscombe has made over the past two seasons and to thank him for his hard work and dedication," commented Ulster Rugby chief executive Shane Logan. "Les Kiss will have an expanded remit for the Province's director of rugby and will lead the coaching staff, assisted by Jonny Bell and Neil Doak and will manage first team selection," explained Logan. "His appointment allows us time to recruit for long-term success." Kiss will take up his duties on Saturday, 19 July. Under Anscombe, Ulster reached the quarter-finals of the Heineken Cup twice, losing to English Premiership outfit Saracens on both occasions. They lost to Leinster in the Pro12 decider in 2013 and fell to the same opposition at the semi-final stage this season. The New Zealander had agreed a one-year extension to his contract in February, which was due to keep him in Belfast until the end of the 2014-15 campaign. Kiss was appointed Ireland defensive coach under Declan Kidney in 2009, playing a part in achieving a Grand Slam that had eluded the Irish for 61 years, in his first year in the job. After Kidney's departure, Kiss became the head coach of the Irish team as an interim appointment for their 2013 summer tour to North America. The 49-year-old resumed his role as defence coach after the tour when Joe Schmidt took over the reins as Ireland coach.